The most liberating hyperlink the Internet has yet invented. Returning home after a week out of the country and off the grid, I was struck by two things. The first was that my nine-month-old cat had grown and her coat had turned darker. The second was that my personal email account had been taken over by robots. No, I wasn’t the victim of a sudden, malicious, Mat Honan-style hack. Rather, I was a victim of my own impulses: the impulse to stay connected, to not miss out on things, to be the first to hear about a bargain or a breaking news item. My email account was no longer primarily a means for me to communicate with people. It had instead become a tool for marketers, corporations, and social networks to get their messages to me in the most direct and obtrusive way possible. I was getting Groupon Daily Deals, Groupon Goods, Groupon Getaways, and Groupon Now alerts. There were Google Offers and Google News Alerts, Facebook Notifications and LinkedIn Updates, new Twitter followers and old tweets that Twitter was concerned I might have missed. There were alumni newsletters, news newsletters, and newsletters from the wine store I used to frequent when I lived in San Francisco. Amazon, Apple, and a half-dozen other corporations wanted to show me their latest products. Travelzoo and Kayak wanted to share the hottest travel deals. None of this was spam, in the sense of unsolicited messages from mystery-meat entities. It was what’s known as bacn—stuff that I had signed up for, whether on purpose or by accident when I opted in to some website, product, service, or group. Scattered scarce and far between amid this mass-produced glop were a handful of messages from actual, individual people. These real emails had become, I realized, a marketing tool themselves. Legitimate emails from friends were the bait that kept me checking my mail several times a day, even as I increasingly got myself caught in traps set by corporations and social networks trawling for impulse buys and page views. As with my kitten’s growth, my email account’s metamorphosis into a tool for marketers’ convenience was something that had been happening gradually and steadily. But it was only observable after returning from an absence. Seeing all of those mass emails at once, accumulated in just seven days’ time roused me to action. 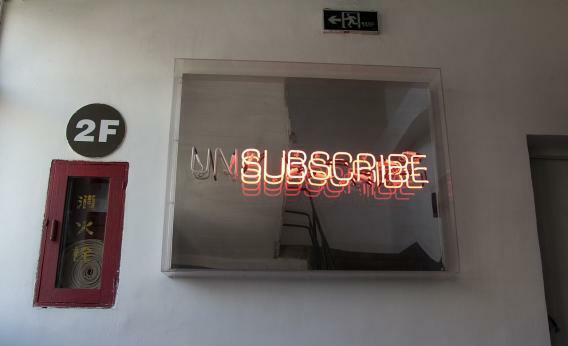 I turned to the most liberating hyperlink the Internet has yet invented: the one at the bottom of every (legitimate) mass email that says “unsubscribe.” I binged on it cathartically for nearly an hour, opting out of almost everything I had opted into over the past decade. When I was finished, I felt purified. So far today I have received fewer than a dozen emails, and all but two have been from human beings. Remember when checking your email was fun? When a mechanized voice could say “You’ve got mail” and you would feel genuinely excited to see what it was? I had forgotten that feeling, but I remembered it today.